I had the pleasure of giving an exclusive interview to the B.O.B. Interior Design Magazine in South Korea. 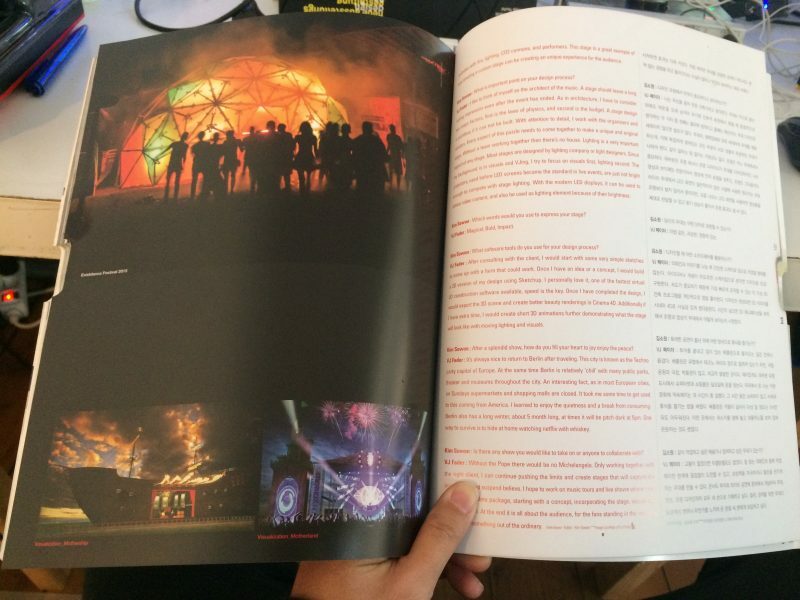 In this interview I gave my insight into my stage design career and working process. You may click on this link to view the full interview PDF document. Kim Sowon : Could you please introduce yourself to our readers? VJ Fader : My Korean name is Choi Moonbong, my artist name is VJ Fader, my friends call me James. My family background is Korean Chinese. Last time when I visited South Korea was in 2011 for an artist residency called Gachang in the country side of Daegu. I have been living and studying in Los Angeles since I was a teenager. About 4 years ago I moved to Berlin where I call home. I studied in Illustration major at Art Center College of Design in Pasadena, USA. I was passionate about electronic music and had an interest in music videos and animation. After graduating in 2002 I started VJing at small clubs and parties. I’m also a self taught programmer and software developer working with Max/Msp/Jitter, Processing, TouchDesigner and Unity. In the past 5 years my professional career started involving stage designs. Kim Sowon : What kind type of stages do you mainly work on? 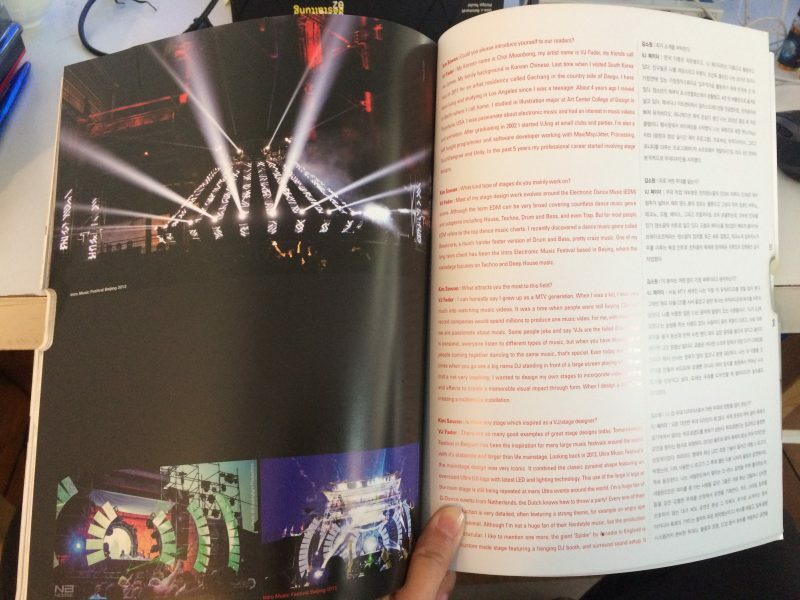 VJ Fader : Most of my stage design work evolves around the Electronic Dance Music (EDM) scene. Although the term EDM can be very broad covering countless dance music genre and subgenre including House, Techno, Drum and Bass, and even Trap. But for most people EDM refers to the top dance music charts. I recently discovered a dance music genre called Breakcore, a much harder faster version of Drum and Bass, pretty crazy music. One of my long term client has been the Intro Electronic Music Festival based in Beijing, where the mainstage focuses on Techno and Deep House music. Kim Sowon : What attracts you the most to this eld? VJ Fader : I can honestly say I grew up as a MTV generation. When I was a kid, I was very much into watching music videos. It was a time when people were still buying CDs and record companies would spend millions to produce one music video. For me, with most VJs, we are passionate about music. Some people joke and say ‘VJs are the failed DJs’. Music is personal, everyone listen to different types of music, but when you have thousands of people coming together dancing to the same music, that’s special. Even today most of the times when you go see a big name DJ standing in front of a large screen playing on a stage, that’s not very inspiring. I wanted to design my own stages to incorporate video, lighting and effects to create a memorable visual impact through form. When I design a stage, I’m creating a multimedia installation. Kim Sowon : Is there any stage which inspired as a VJ/stage designer? VJ Fader : There are so many good examples of great stage designs today. Tomorrowland Festival in Belgium has been the inspiration for many large music festivals around the world with it’s elaborate and larger than life mainstage. 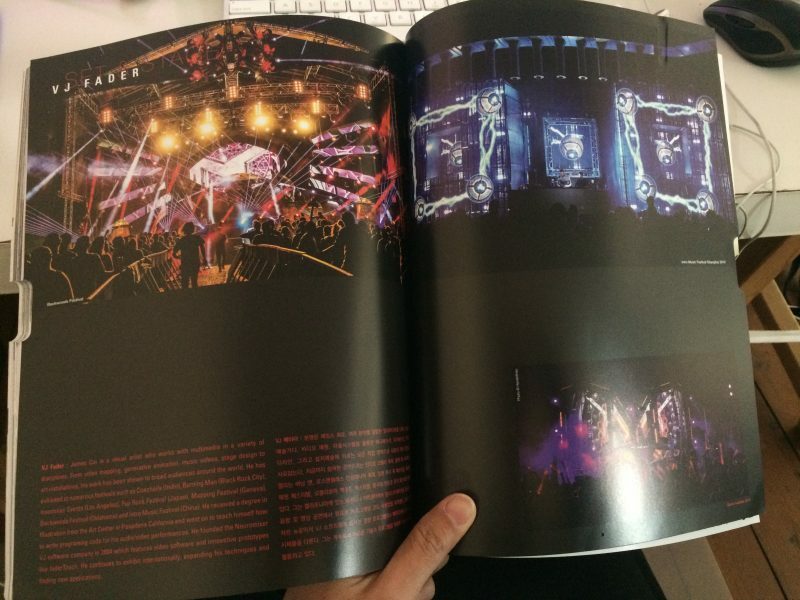 Looking back in 2013, Ultra Music Festival’s the mainstage design was very iconic. It combined the classic pyramid shape featuring an oversized Ultra (U) logo with latest LED and lighting technology. 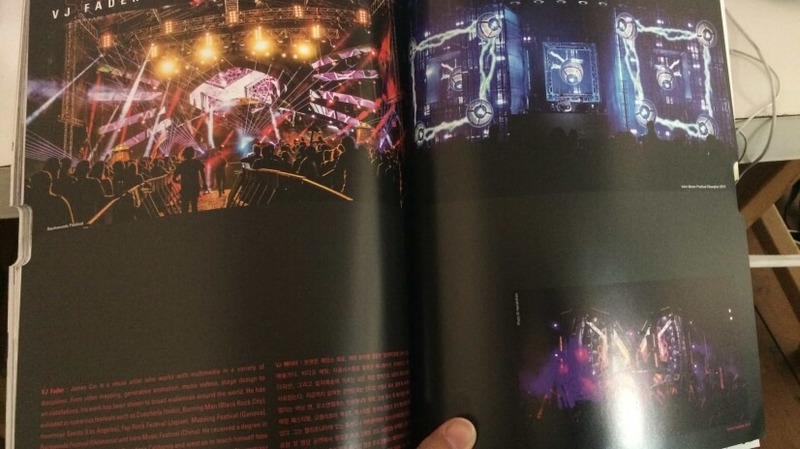 This use of the large U logo at the main stage is still being repeated at many Ultra events around the world. I’m a huge fan of Q-Dance events from Netherlands, the Dutch knows how to throw a party! Every one of their stage production is very detailed, often featuring a strong theme, for example an angry ape or a mystic animal. Although I’m not a huge fan of their Hardstyle music, but the production is just spectacular. I like to mention one more, the giant ‘Spider’ by Arcadia in England is a totally custom made stage featuring a hanging DJ booth, and surround sound setup. It animates with re‚ lighting‚ CO2 cannons‚ and performers. This stage is a great example of how amazing a custom stage can be creating an unique experience for the audience. Kim Sowon : What is important point on your design process? VJ Fader : I like to think of myself as the architect of the music. A stage should leave a long lasting impression even after the event has ended. As in architecture, I have to consider two major factors, first is the laws of physics, and second is the budget. A stage design is pointless if it can not be built. With attention to detail, I work with the organizers and vendors. Every aspect of this puzzle needs to come together to make a unique and original stage. Without a team working together then there’s no house. Lighting is a very important aspect of any stage. Most stages are designed by lighting company or light designers. Since my background is in visuals and VJing, I try to focus on visuals rst‚ lighting second. The projectors, used before LED screens became the standard in live events, are just not bright enough to compete with stage lighting. With the modern LED displays‚ it can be used to deliver video content‚ and also be used as lighting element because of their brightness. Kim Sowon : Which words would you use to express your stage? VJ Fader : Magical, Bold, Impact. Kim Sowon : What software tools do you use for your design process? VJ Fader : After consulting with the client, I would start with some very simple sketches to come up with a form that could work. Once I have an idea or a concept, I would build a 3D version of my design using Sketchup. I personally love it, one of the fastest virtual 3D construction software available‚ speed is the key. Once I have completed the design, I would export the 3D scene and create better beauty renderings in Cinema 4D. Additionally if I have extra time, I would create short 3D animations further demonstrating what the stage will look like with moving lighting and visuals. Kim Sowon : After a splendid show, how do you ll your heart to joy enjoy the peace? VJ Fader : It’s always nice to return to Berlin after traveling. This city is known as the Techno party capital of Europe. At the same time Berlin is relatively ‘chill’ with many public parks, theater and museums throughout the city. An interesting fact, as in most European cities, on Sundays supermarkets and shopping malls are closed. It took me some time to get used to this coming from America. I learned to enjoy the quietness and a break from consuming. Berlin also has a long winter, about 5 month long, at times it will be pitch dark at 5pm. One way to survive is to hide at home watching net ix with whiskey. Kim Sowon : Is there any show you would like to take on or anyone to collaborate with? VJ Fader : Without the Pope there would be no Michelangelo. Only working together with the right client, I can continue pushing the limits and create stages that will capture the imagination and suspend believe. I hope to work on music tours and live shows where I can deliver a complete package, starting with a concept, incorporating the stage, visuals and lighting design. At the end it is all about the audience, for the fans standing in the crowd to experience something out of the ordinary. 김소원 : 자기 소개를 부탁한다. VJ 페이더 : 한국 이름은 최문봉이고, VJ 페이더라는 이름으로 활동하고 있다. 친구들은 나를 제임스라고 부른다. 조선족 출신인 나는 2011년 대구시 가창면에 있는 가창창작스튜디오 입주작가로 활동하기 위해 한국에 간 적 있다. 청소년기 때부터 로스앤젤레스에서 생활했고, 4년 전 베를린으로 옮겨와 살고 있다. 패서디나 아트센터에서 일러스트레이션을 전공했지만, 전자음악에 빠져 뮤직비디오, 애니메이션 쪽에 관심이 생긴 나는 2002년 졸업 후 작은 클럽이나 행사장에서 브이제잉을 시작했다. 나는 독학으로 배운 맥스/Msp/ 지터 (음향과 영상 실시간 제어 프로그램), 프로세싱, 터치디자이너, 그리고 유니티를 다루는 프로그래머이자 소프트웨어 개발자이기도 하다. 5년 전부터 본격적으로 무대디자인을 시작했다. 김소원:주로어떤무대를맡는가? VJ 페이더 : 무대 작업 대부분은 전자댄스음악 (EDM) 위주다. EDM은 워낙 범주가 넓어서 여러 댄스 음악 장르는 물론이고 그보다 하위 장르인 하우스, 테크노, 드럼, 베이스, 그리고 트랩까지도 모두 포괄하는데, 대부분 EDM을 인기 댄스음악 차트로 알고 있다. 드럼과 베이스를 정신없이 빠르게 몰아치는 브레이크코어라는 댄스음악 장르를 최근 새로 접했고, 테크노와 딥하우스가 주를 이루는 북경 인트로 전자음악 축제에 참여해온 의뢰인과 오랫동안 같이 작업했다. 김소원 : 이 분야는 어떤 점이 가장 매력이라고 생각하는가? VJ페이더:사실MTV세대인나는어릴적뮤직비디오를정말많이봤다. 그때만 해도 다들 CD를 사서 들었고 음반 회사는 뮤직비디오에 투자를 아끼지 않았다. 나를 비롯한 많은 VJ는 음악에 열정이 있는 사람들이다.‘VJ가 DJ에 밀렸다’는 농담을 하는 사람도 있다. 사람마다 음악 취향이 다르고, 서로 다른 음악을즐겨듣는데만약수천명이모두같은음악을들으러모이고춤까지 춘다면 그건 엄청난 일이다. 요즘은 커다란 스크린 앞에서 유명 DJ가 디제잉을 한다고해서신나는경우가많지않으니분명대단하다.나는내이름을건 무대를 만들어 비디오와 조명뿐 아니라 여러 장치를 동원해서 뛰어난 시각 효과를 선보이고 싶다. 요새는 무대를 디자인할 때 멀티미디어 설치물도 제작한다. 김소원:VJ겸무대디자이너로서어떤무대의영향을많이받는가? VJ페이더:요즘대단한무대디자인이꽤많다.세계곳곳의여러음악축제가 벨기에에서 열리는 투모로랜드를 본보기 삼는다. 투모로랜드는 정교하고 웅장한 공연을 펼치는 행사로 유명하다. 2013년 울트라 음악 축제의 중심 무대 디자인은 상징적이었다. 피라미드 형태에 최신 LED 조명 기술이 들어간 대형 U 로고가 박혔는데,이때사용한U로고가그후에열린다른나라의울트라공연에서도 계속 등장한다. 나는 네덜란드에서 열리는 Q-댄스 공연을 무척 좋아하는데 네덜란드인은 파티를 좀 아는 사람들 같다! 그들은 가끔 화난 고릴라나 신비한 동물 같은 강렬한 주제를 선정해서 공연을 기획한다. 하드 스타일 장르를 선호하지않는내가봐도공연은환상그자체다.추가로소개하는영국 아카디아 축제의‘거미’는 철저히 주문 제작됐는데 DJ 부스를 매달고, 입체 음향 시스템까지 완비한 무대다. 불꽃과 조명, CO2 분사 장비를 작동하고 공연을 시작하면 효과는 더욱 커진다. 직접 제작한 무대를 관람한 관객이 어디서도 본 적 없는 경험을 하고 돌아간다는 사실이 얼마나 멋진지 보여주는 대표 사례다. 김소원 : 디자인 과정에서 무엇이 중요하다고 생각하는가? VJ페이더:나는자신을음악전문건축가라고생각한다.무대는자고로끝난 뒤에도 여운을 오래 남겨야 하기에 건축적 측면에서 봤을 때 중점적으로 생각하는 두 가지 중 첫째는 물리학 법칙이고 둘째는 예산이다. 무대 디자인은 세워지지 않으면 쓸모가 없다. 주최자, 협력업체와 모여 세세하게 무대를 계획 하는데, 이때 복잡하게 얽혀있는 모든 부분이 서로 맞물려 독창적인 무대가 나와야 한다. 같이 일하는 팀 없이는 지원군도 없다. 조명은 어느 무대에서나 중요하다. 대부분은 조명 회사나 조명 디자이너가 무대를 디자인하지만, 나는 영상과 브이제잉 전문이어서 영상에 먼저 초점을 맞추고, 조명은 그다음이다. 라이브 무대에서 LED 화면이 일반적이지 않던 시절에 사용한 영사기는 무대 조명보다 밝지 않아서 묻히지만, 요즘 나오는 LED 화면을 사용하면 영상물을 제대로전달할수있고밝기성능이좋아서조명효과도낼수있다. 김소원 : 디자인할 때 어떤 소프트웨어를 활용하는가? VJ페이더:의뢰인과이야기를나눈후간단한스케치로앞으로작업할형태를 잡는다. 아이디어나 개념이 떠오르면 스케치업으로 생각한 디자인을 3D로 구현한다.속도가중요하기때문에가장빠르게조작할수있는이가상3D 건축 프로그램을 개인적으로 정말 좋아한다. 디자인이 완성되면 3D 이미지를 시네마 4D로 사실감 있게 렌더링한다. 시간이 남으면 3D 애니메이션을 제작 해서 조명과 영상이 무대에서 어떻게 보이는지 시연한다. 김소원 : 화려한 공연이 끝난 뒤에 어떤 방식으로 휴식을 즐기는가? VJ페이더:투어를끝내고집이있는베를린으로돌아오는길은언제나 즐겁다. 베를린은 유럽에서 테크노 파티의 장으로 알려져 있는가 하면, 국립 공원과 극장, 박물관이 많고, 비교적 쌀쌀한 곳이다. 재미있게도 대부분 유럽 도시에서 슈퍼마켓과 쇼핑몰은 일요일에 문을 닫는다. 미국에서 온 나는 이런 문화에익숙해지는데시간이좀걸렸다.그시간동안소비하지않고사색과 휴식을 즐기는 법을 배웠다. 베를린은 겨울이 길어서 다섯 달 정도는 5시만 되도 어두워진다. 이런 곳에서는 위스키를 옆에 놓고 넷플릭스를 보며 집에 은둔하는 것도 괜찮다. 김소원 : 같이 작업하고 싶은 예술가나 참여하고 싶은 무대가 있는가? VJ 페이더 : 교황이 없었으면 미켈란젤로도 없었다. 잘 맞는 의뢰인과 함께 작업 해야만 한계에 끊임없이 도전할 수 있고, 상상력을 자극하거나 질문을 던지게 하는 무대를 만들 수 있다. 콘서트 투어와 라이브 공연에 참여해서 개념부터 무대, 영상, 조명 디자인까지 모두 내 손으로 기획하고 싶다. 결국, 관객을 위한 무대다. 일상에서 벗어나 무언가를 느끼러 온 관중 속 팬에게 보답하고 싶다. Click here to view this full interview PDF document.